With the upcoming of the rumor release date, images about iPad 3 are flooding over the internet frequently. In addition to the released iPad 3 display and processor, there are many contrastive pictures about iPad 3 and iPad 2. As it used to be said, iPad 3 is a little bit thicker than iPad 2, and Macbook Air wedge design is introduced to its appearance design. Seen from the contrast pictures, Apple iPad 3 is really thicker than iPad 2 and the reason lies in that Macbook Air Wedge design has been introduced to it. The difference is more noticeable in some edge part especially. The thickness difference between the two generation iPad is around 1—1.5mm which is almost the same as the rumor said. In addition, the iPad 3 camera aperture diameter is increased which means that there will be an improvement and upgrade on its camera specification. However, according to the analysis Apple will not apply 8-million-pixel camera to it due to the expensive cost. But there is no doubt that camera effect will be improved. Based on the picture leaked, there are no many differences between this glass panel and components of iPad 2, and the only difference lies in the cable parts on the top of the display. And drawn from this panel we can say that iPad 3 positive main design including the round primary key, front-facing camera and light sensor will adopt the previous configuration. And according to the information received before, Apple iPad 3 will be equipped with 9.7-inch retina touch screen, and the resolution support is two times of the past, that is to say, it will be upgraded from 1027 x 768 pixels to 2048 x 1536 pixels. Despite the rumors that Apple iPad 3 will adopt quad-core A6 processor, but from the leaked information on main board, the next generation Apple tablet does not use the so-called A6 processor but A5 upgrade version A5X S5L8945X. And news from Foxconn reveals that iPad 3 processor specification will be dual-core ARM CORTE X-A9 W/SMP 950Mhz and this probably means that Apple iPad 3 employs 1.5GHz dual-core processor. 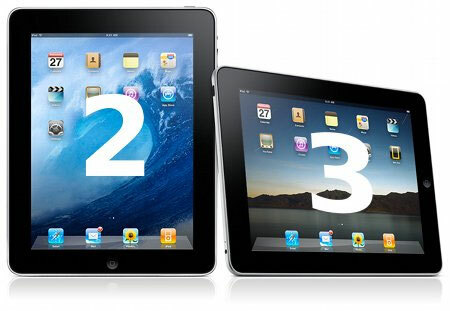 Therefore, people say that the new generation iPad will be named as iPad 2S but not iPad 3. Whether it is iPad 3 or iPad 2S, RAM will be upgraded to 1GB and will use the same GPU as iPhone 4S. As to wireless network, LTE 4G network support is added to it. Apple will increase the built-in battery capacity in order to reach more ideal endurance ability. And according to reliable sources, Apple iPad 3 or iPad 2S will be provided with three capacity versions for options: 16GB, 32GB and 64GB. And for the sake of the increase of hardware cost, the WiFi version will be more expensive: $579, $679 and $779. And WiFi+3G version will be $699, $799, and $899. How to Convert AVI to iPad 3? How to Convert MKV to iPad 3? How to Convert FLV/F4V to iPad 3?